s proven internal recoil system offers reduced recoil and a compact platform. To enhance accuracy, the MCX VIRTUS Pistol features the Matchlite Duo trigger for crisp, clean feel. Free-floating M-LOK handguards are available in four lengths. Ambidextrous, AR-style controls and a folding SBX Pistol Stabilizing Brace enable the MCX VIRTUS Pistol to be stowed with ease. Available in Stealth Gray and FDE and built with the highest-quality components, the MCX VIRTUS Pistol sets the standard for size, accuracy and reliability.Features:- SIG Matchlite Duo Trigger: Superb accuracy is aided by the crisp, light feel of the SIG Matchlite Duo trigger- Folding SBX Pistol Stabilizing Brace: To make the package as compact as possible, the MCX VIRTUS is equipped with a folding SBX Pistol Stabilizing Brace- Interchangable Cold Hammer-Forged Barrels: Modularity for any mission is achieved by interchangeable cold hammer-forged barrels available in multiple calibers and lengthsSpecifications:- Operating System: Gas Piston- Caliber: 5.56 NATO- Action Type: Semi-Auto- Barrel Length: 11.5"- Overall Length: 31"- Overall Width: 2.8"- Height: 8"- Twist Rate: 1:7- Threads: 1/2 in - 28 tpi- Accessory Rail: M-LOK- Mag Type: AR-15- Mags Included: (1) 30rd Polymer Mag- Stock Type: PSB- Barrel Material: Cold Hammer Forged Carbon Steel- Trigger Type: Matchlite Duo- Collapsed/Folded Length: 22"- Trigger Weight: 4.5-6 lbs. 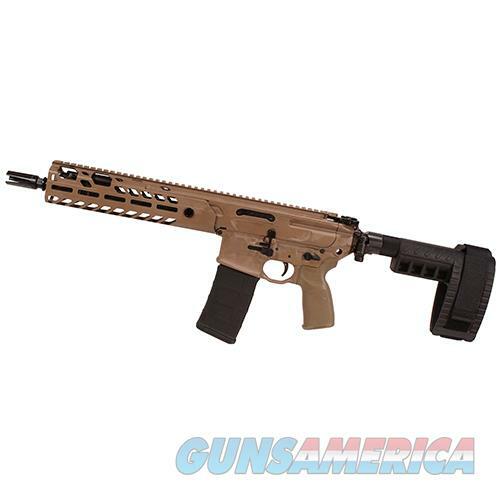 (20-27N)- Twist Rate: 1:7- Forend Type: Alloy- Grip Type: Polymer- Receiver Finish: Flat Dark Earth - Weight: 7.4 lbs.